Start reading Love & Friendship on your Kindle in under a minute. This book wasn't exactly what I expected from reading the previous reviews. If I had to do it over, I'd just go see the movie, which I really enjoyed. I'm a diehard Austen fan and have read many (probably too many) variations and sequels. This one is very clever, but the style was a bit arch for my taste. I enjoyed re-reading the original more. I do like the new ending and think Jane would too if she were alive today. I think I'm mostly irked that I shelled out so much money for an ebook that was really quite short. It included the original Austen, but I could have gotten that for free. The matinee I caught for five bucks was a much better value. I bowled over laughing after reading every sentence written in this outstanding Austen re-creation! Whit Stillman is at his very best comical self with Love and Friendship, and I can very well imagine his book being applauded the world over for its ingenious and sparkling humor! Lady Susan Vernon is not vindicated at all, and therein lies the intelligent irony of this novel. Austen would be very proud! This book is a must-read for everyone who ever claimed to be a Janeite! 4.0 out of 5 starsStilman is a genius. 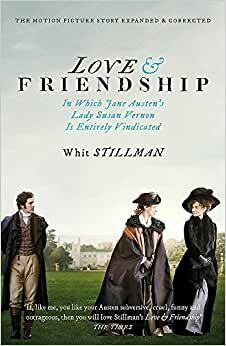 loved the movie and the novelization... this has Austen's original and Stilman's screenplay... Pure genius. 5.0 out of 5 starsEnjoy full!! Loved the book. Bought the book after watching the movie. Book is always than the movie, but in this case, I enjoyed how they were able to portray the characters in the movie.